At long last, the House Agriculture Committee Chairman Michael Conaway (R-TX) introduced his draft of the 2018 Farm Bill on Thursday. And we’ve got work to do. The bill maintains important provisions for beginning farmers, such as the Beginning Farmer and Rancher Development Program, but it would phase out programs that are critical to young farmers, compromise farmland conservation, and hurt the consumer safety net. The next step in the farm bill process is the agriculture committee markup next Wednesday. Between now and then, we need you to raise your voice and tell Republicans and Democrats what amendments and fixes are needed to get this bill into shape. Moving forward, here’s the good, the bad, and what you can do to help. 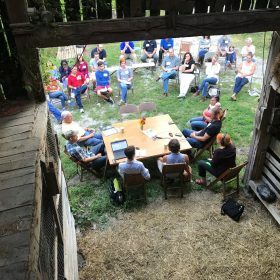 As we express concern about the hyper-partisan path that this farm bill draft has taken and what that means for ultimately passing a farm bill on time, it’s important to acknowledge what this bill gets right, and where the Committee seems to have listened to the sustained and growing young farmer movement. There’s only one program in the farm bill with “beginning farmer” in the title — the Beginning Farmer and Rancher Development Program (BFRDP). If that program, which funds technical training, business planning, farmland access and transition, and other support critical to new farmers, is not reauthorized by the September 30th deadline, it’ll be eliminated. Fortunately, this bill would fund BFRDP at its current level of $20 million per year and make some important improvements to the program’s implementation. While still nowhere near the level of investment required to revitalize our aging agricultural sector, this is generally good news. The bill also preserves some programs related to the top challenge young farmers face: land access. The Agricultural Conservation Easement Program, which helps preserve farmland from development and saw its funding cut in half in 2018, would be restored to $500 million per year. We’ll have to continue advocating for stronger easements that keep conserved farmland affordable, but that’s a win (read “the bad” for a few caveats here). The Regional Conservation Partnership Program (RCPP) receives its own dedicated funding stream to facilitate public-private partnerships and leverage private dollars for conservation projects. The bill would help reign in rental rates in the Conservation Reserve Program that often outcompete beginning farmers for land, and continue the Transition Incentives Program (CRP-TIP), which incentivizes farmers participating in CRP to lease farmland to beginning farmers. The bill also allows for more flexible eligibility criteria for FSA farm ownership loans that account for the diverse educational and occupational backgrounds many young farmers enter the field from. Two new initiatives could help inch us closer to a more comprehensive approach to land access: the creation of a federal “Commission on Farm Transitions” and a new initiative to collect and report data and analysis on farmland ownership, tenure, transition, and entry of beginning farmers. Lastly, the bill maintains funding for outreach and assistance to socially disadvantaged farmers (the 2501 program), but makes concerning changes that could further undermine the purpose of the program. Though local and organic programs mostly fared poorly (see below), there are a few bright spots. The Organic Research and Extension Initiative (OREI) sees an increase in dollars, and funding for Specialty Crop Block Grants is maintained. And in the one positive change to the Nutrition Title, funding for the Food Insecurity and Nutrition Incentives (FINI) program, which expands low-income Americans’ ability to purchase fresh produce at places like farmers’ markets, is dramatically increased. Set-asides and priority ranking for beginning farmers across most programs are maintained, but not increased. The exception is in Whole Farm Revenue Protection, the new risk management tool for diversified growers, where beginning farmer benefits are extended from five years to ten. Lastly, provisions from the NYFC-endorsed STRESS Act (H.R. 5259) to create the Farm and Ranch Stress Assistance Network and expand mental health resources to farmers and farmworkers is included in the bill. Our 2017 National Young Farmer Survey found that many young farmers are starting small and capitalizing on growing demand for local food by selling sustainably-produced food directly to consumers through farmers’ markets, CSAs, and local restaurants. Unfortunately, local and organic initiatives take an absolute beating in Chairman Conaway’s farm bill. Mandatory funding for the National Organic Certification Cost Share Program (NOCCSP), an effective program to help young farmers offset the cost of certification, is eliminated. Mandatory funding for Value-Added Producer Grants (VAPG), which help young farmers diversify their revenue streams and grow their businesses to meet local demand, is eliminated. Mandatory funding for the Farmers Market and Local Food Promotion Program (FMLFPP), which builds out local direct-to-consumer markets and has created opportunity for young farmers across the country is eliminated. The Conservation Title of this draft farm bill sees the most dramatic changes aside from the Nutrition Title, and many of those changes are incredibly problematic. The restoration of funding for ACEP is sourced by multiple reforms that will undermine the integrity of the program, including a waiver that appears to allow for oil and gas drilling and other mineral development on conserved farmland. The bill would also dilute the limited amount of funding meant for farmland preservation by allowing projects that contain no farmland to be funded, and removing the income cap that encourages wealthy landowners to donate their easements rather than use up scarce federal resources. The ACEP reforms do not include prioritization of projects that ensure the affordability of conserved farmland for future generations, a long-time priority for NYFC that would ensure the best use of public dollars. Perhaps the biggest change is to working lands programs. The Conservation Stewardship Program (CSP), USDA’s largest conservation program, is effectively eliminated and swallowed whole by the Environmental Quality Incentives Program (EQIP). Although the Chairman has maintained that he wants to continue some portions of CSP through the merged program, the devil is in the details, and the actual legislative text suggests something entirely different. As written, CSP, which currently funds long-term conservation practices on over 70 million acres of farmland and which 13% of young farmers from our survey reported benefiting from, would be completely hollowed out. On top of eliminating CSP, the bill cuts overall funding to the working lands programs. With current drought conditions in the West, maintaining conservation funding is critical to help farmers prepare and be more resilient to increasingly dry and variable conditions. The bill makes changes to Farm Service Agency loans that could squeeze beginning farmers out as demand for credit continues to increase. Raising the loan limit on guaranteed loans will surely benefit larger farms, but it will also mean fewer dollars to go around for beginning farmers already struggling to compete for capital. Lastly, there are some big changes to nutrition programs. This isn’t NYFC’s expertise, but we stand in solidarity with groups protecting food security for the most vulnerable Americans. We will be sharing more information from partners here soon. This bill will not be improved and these imperiled programs will not be saved without your input. If you want to be part of NYFC’s rapid response farm bill effort, it’s as simple as this: text “FARM” To 40649 or sign up here. We will be in touch ASAP with our first action. Share and stay tuned.